2012 05 16, 1300 – 1600 UT . NOAAs 11476, 11477, 11478, 11479, 11481, 11482, 11484, 11485. Temp: 17.2°-27.8C, calm-N 5mph, clear. Seeing: Wilson 4.8-4.6, Transparency: 5/6, 50x. Maxscope DS 60mm H-alpha, LXD75, Baader Planetarium Hyperion 8-24mm Mark III. Sketches created at the eyepiece with black Strathmore Artagain paper, white Conte’ crayon and pencil, white Prang color pencil, Derwent charcoal pencil, black oil pencil. As of this morning, there were 8 active regions on the Sun. Plage and filaments scattered over three quarters of the solar disk with sunspots popping in and out of view crisply as it moved in and out of the scope’s sweet spot. A large diffuse quiet region filament, similar to the one observed on May 6, 2012, was to the SE quadrant reaching out over the limb. 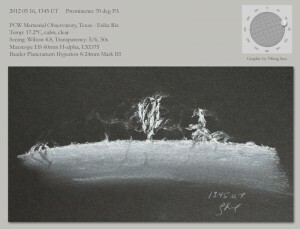 Two large bright prominences were located at PA 70 and 115 with several smaller ones scattered around the limb. The prom at 70 degrees had very faint wisps of structure reaching between the three brightest regions. 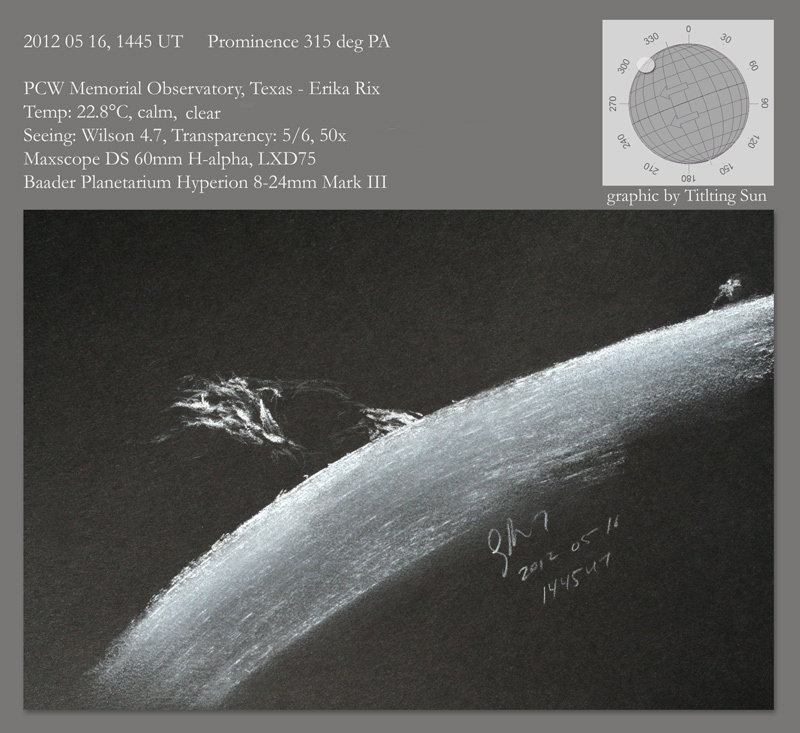 I had started to draw the full solar disk when a faint pair of prominences to the NW caught my eye. I had accidentally kicked the adaptor that was plugged into my power pack and the mount turned off, allowing the disk to drift across my field of view. When this happened, a huge billow of plasma floated above the limb. It was attached by very slender lines of plasma to the thick fainter prom at the 315 degrees position angle. It had the appearance of a large balloon being blown to the south while tethered to the ground. Tossing my larger sketchpad to the side, I grabbed the smaller pad and quickly sketched this prom. As the course this morning’s observation went on, the billowed top of the prominence changed quite dramatically. I almost expected it to either break free or collapse on itself before my session ended but by the time I completed the full disk sketch, it was still there. The prominences near 1476 were dense and compact. The plage was very brightly formed as several slender lines within that active region. The main sunspot in 1476 was very easy to spot in h-alpha although the ARFs were very thin and few. 1479 is reminiscent of 1476 several days ago, although the preceding spot standing alone is on the opposite end. 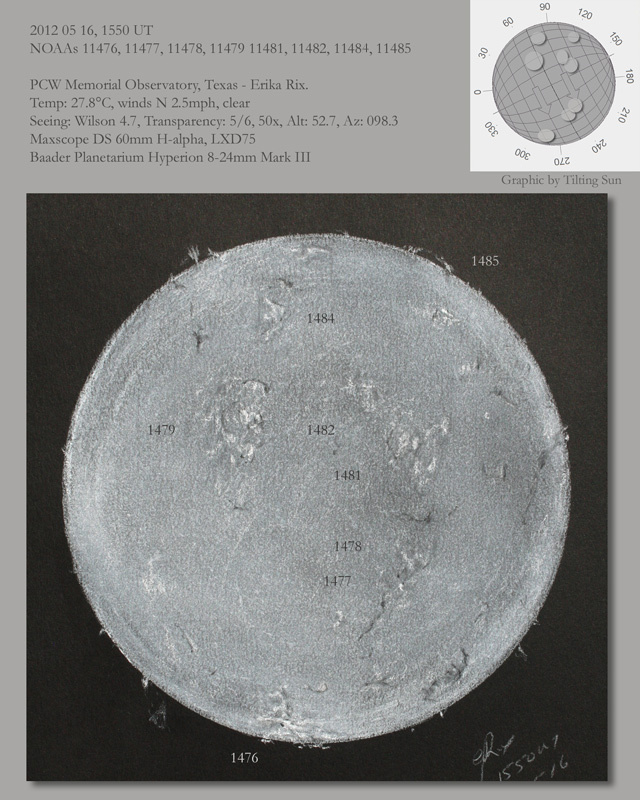 Of course, another difference that the sunspots in 1479 are smaller. They may develop more as the days go on. Here’s hoping for beautiful weather so we can keep an eye on it. Informative write up and superb sketching. Wow–that’s terrific! The way you render prominences is outstanding–so realistic. I wish I could do proms half as well. Always enjoy your detailed sketches and information. Sounds like the baloon like prom was an exciting sketch to create! Nice sketches serie Erika. !